"The Cocos trip was a great vacation and adventure and I want to thank you for your assistance. Trip out and back was warm, sunny and calm and seemed to go by fast, the weather at Cocos was the same except for one evening when a storm blew in and later in the week we had a rainy day which fed the beautiful water falls along the island coast. I personally don’t care if it rains while diving, we’re there to get wet anyway. One afternoon we went to the island ranger station and hiked about 45 minutes up to nice waterfall for a swim and back massage under the falling waters. Diving was amazing, we saw marble rays, mobulus rays, sharks of all kinds including hammerheads, some on our safety stops, the seas and were moderate to calm. Diving from the pangas was easy, roll back into the water and climb the ladder back into the boat. We had a couple of chances to dive and snorkel near a bait ball with dolphins, sharks, and large tuna feeding on the smaller fish in the ball. John and I took the submarine ride down to 200 meters on the Deep See, we saw a palm frond from previous day’s storm lying on the bottom with a moray eel looking out from under it and two frogfish sitting on the branch. A mobulus ray swam by to check out the new neighbors! They gave a certificate of the dive, a tee shirt, and a DVD. 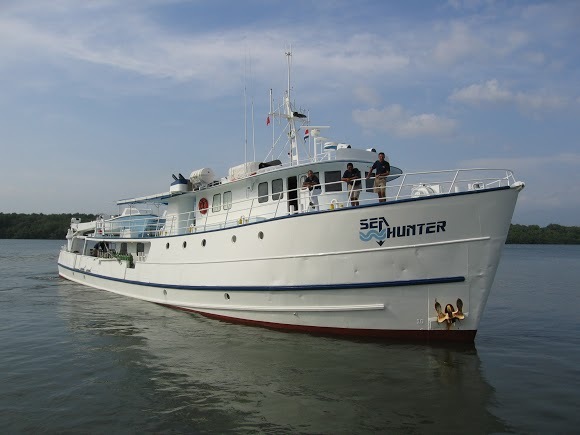 The Sea Hunter was very comfortable and we could wander anywhere we wanted except the bridge and engine room while we were underway. We set up chairs on the bow for the ride back and worked on our tans and the stock of Imperial beer. The cabins were small though comfortable as usual on a live aboard but we spent most of the time on the sun deck or watching movies in the spacious parlor when we weren’t diving. The crew took excellent care of us while diving or back on the boat and we always had a snack waiting on our return from diving or excursion. Food was very good, dinner started with soup, then a steak, chicken, or pork loin and a vegetable along with salad and desert. Eggs, bacon, cold serials, with fresh fruit and juices in the morning and the excellent Costa Rican coffee by the gallon. Lunches were hot meals with rice, beans, and a meat on tray. All in all it was an excellent trip that I would do over again."